The story of how AMC’s 1979 joint venture to produce Jeeps in Beijing ended in tears is perhaps the closest thing to a classic work on doing business in post-Mao China. It’s required reading for anyone venturing to the world’s most populous nation. 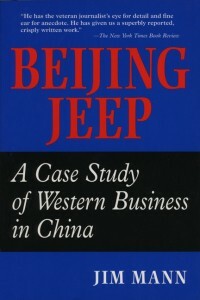 The best ‘business’ book previously written about China is probably Jim Mann’s Beijing Jeep, an account of the ill-fated auto joint venture in China’s early days of experimenting with capitalism. “Even today , five years after its first publication, Beijing Jeep remains one of the best—if not the best—book-length account of doing business in China because of its tale of the hidden agendas that underpinned many of the major problems at the first Sino-foreign vehicle joint venture. At the book’s core are the revelations of the lengths the Chinese government was willing to go to create a large-scale joint venture with a major overseas company that on the surface appeared successful. A venture that seemed to make money—whatever its actual problems were—would not only attract other business from abroad but convince firms already in China but struggling that success was possible, and thus more likely to blame themselves for failure rather than the environment in which they operated.